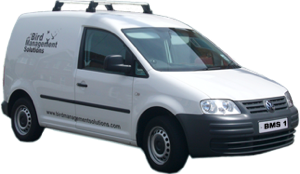 Formed in 2002, Bird Management Solutions is a pest control company that are specialists in bird proofing and control against all urban pest bird species. We carry out all aspects of bird work to the highest standard and all our work is guaranteed. We have full public and products liability to the value of £5m and are members of the National Pest Technicians Association (NPTA). We are certificated by the Royal Society for the Promotion of Health (RSPH) and hold certificates in health and safety matters from the Institute of Occupational Safety and Health (IOSH). All our operatives carry the relevant CSCS cards for carrying out bird work in the construction industry. We are trained in the use of powered access platforms by the International Powered Access Federation (IPAF). In addition to our bird services, we also carry out general commercial and domestic pest prevention and control work through our sister company BMS Pest Control Services.